Real Estate Photo Editing involves a lot of steps. Every one of them is supported by powerful computer programs that are made for specific operations. Real Estate photos are often taken in many stages. It is inconceivable of nature to hold conditions of sky, light, and other ambiance constant over that long period. Nature by its very nature is ever changing and it is not prudent to expect the impossible in any venture especially if it is long drawn as real estate. The only choice is to take recourse to technology. Fortunately digital technology has come up with solutions to the ever increasing demands of quality by the real estate industry. 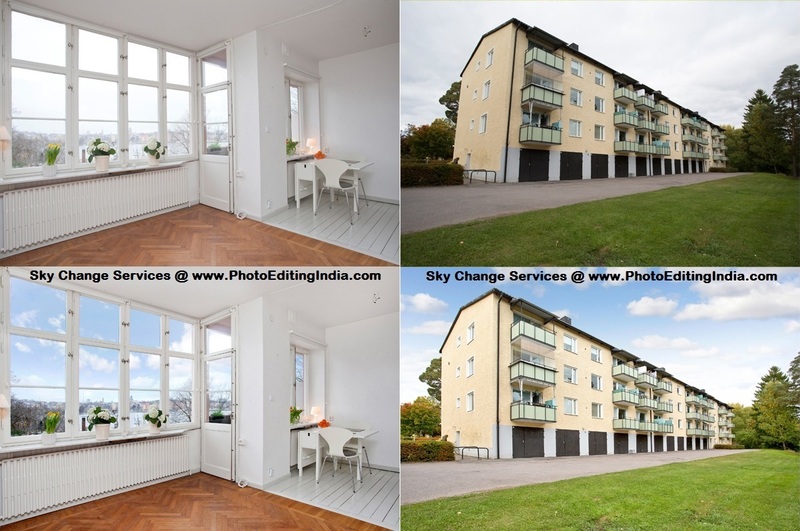 Sky change is a very small but a very crucial and necessary step in real estate photography. As mentioned earlier real estate photography is done in different conditions and in single frames. If an overall view is to be presented to the client, who is a prospective buyer, the property is to be presented in a consolidated whole and that too in a very impressive way in order to generate a strong desire in him to invest his hard earned money into buying it. This is by no means an easy task. This difficult task is executed in many, very exacting steps. The single shots are mixed together and each one is arranged in such a way to form a continuous whole. This step needs tools to align the picture in the correct sequence and properly overlapped. The individual shots are of different exposure and depth of field. Software measures the luminosities of each pixel and arranges them to give a picture which is bright at the centre and gradually dims towards the ends. This is to make the photograph look natural. When we view a scene, the center, in focus, is bright and dims somewhat continuously in a very gradual way towards the edges of vision. These processes are collectively called image mixing and stitching. After this, if required, an HDR processing is done. HDR stands for High Dynamic Range which is the range of the capacity of the camera to see the lightest light and the darkest dark. If the object has a dynamic range more than the camera the highlights will be blown away into white and the darker spot will end up as black blobs. HDR processing if well done will give focused, well-lit, and colorful parts of the scene. Sky Change Services not only changes sky but also the cleaning of the background and the foreground. When individual shots are made at different times it is only natural that the sky in each shot will not be same or look continuous. Of course technology cannot create a new sky. What it tries to achieve is to make the sky look continuous and introduce some cloud features to make the sky more beautiful. It also adjusts the luminosity of the sky also. In general the appearance of the sky in a real estate photo can change the entire appearance of the property. When individual shots are taken chances are there would be unwanted objects in the foreground that will be distracting. Hence the objects are removed and the foreground touched up to mask the removal. Then again there can be discontinuity of the foreground and it may be necessary to introduce a green lawn. All these are affected with the help of computer tools. It would be clear that Real Estate photography and editing is a highly technical affair and for consistent good quality photographs the help of professional service is unavoidable. The professional service providers have to have the best and the latest software to effect all the operation with competence within the given time frame. In short he should have the very best infrastructure in equipment, software and well qualified, trained, and skilled technicians who should also have an artistic bend of mind. Photo Editing India is one such company that has all the above and the experience of catering to an exacting international clientele.